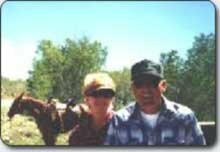 Treat yourself and your family to a refreshing, exhilarating yet relaxing adventure vacation in western Wyoming. The area offers a variety of unforgettable experiences for all ages and interests. Mike and Jamie Kaul, owners of JMK Enterprises, have first hand knowledge of the area and it's opportunities, and will be happy to give you a free consultation about a trip to the Pinedale area; a region noted for its beautiful rocky mountains, abundant wildlife and friendly people. The Kaul's will help you plan a trip to meet the expectations of everyone in your party. Complimentary draft itineraries will be prepared for you, outlining recommended activities, price options and background information on special areas of interest. Proper planning will ensure that your visit will be a pleasant, unforgettable experience. Your blood pressure will drop several points as soon as you arrive in real Wyoming; where there are no stop lights and most of the traffic is wildlife. Let us take the surprise out of an adventure visit to Wyoming. Learn to cast from a certified instructor and immediately apply those skills on some of Wyoming's finest lakes and streams. A full service 4-day horseback trip into the Bridger Wilderness which contains 1300 lakes and miles of connecting streams, filled with hungry trout. Three days of fishing along the beautiful Gros Ventre River. At days end, relax and enjoy the amenitites of a comfortable, full service base camp. Fish productive alpine lakes in a pristine wilderness environment. Adventuresome ladies of any age will enjoy an unforgettable 3 day nature experience in the beautiful, pristine Wind River Mountains and Bridger Wilderness, with base camp being a lovely, well appointed bed & breakfast. 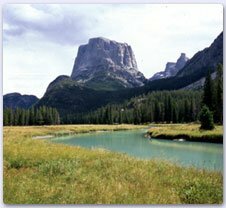 Three days of guided float and/or wade fishing on the Upper Green River and other splendid streams originating in the Wind River Mountains. 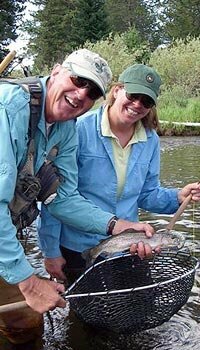 Combine superb fly fishing with historical experiences including attendance at Wyoming's oldest historical pageant, The Green River Rendezvous and visits to the Oregon Trail and museums. Note: These popular events are conducted during peak summer season so we highly recommend you make reservations well in advance.